Bamboo yarn is derived from the bamboo tree native to the Asian continent and is used to make a variety of cloth materials. There are several different types of bamboo yarn, but most claim to be 100 percent treated bamboo and eco-friendly. The reasons for this enthusiasm is two-fold: first, bamboo has been used naturally for many years in China, Japan and the other nations of Asia, and creating new products from the tree allows the cultures to keep their heritage intact and make use of the same materials they have had for generations. Second, bamboo as a plant is considered environmentally sustainable. It requires no pesticides to enhance its growth and is one of the most easily replenishable plants in the world, growing swiftly as long as there is a dependable source of water nearby. The products made from bamboo are both durable; all bamboo creations are completely biodegradable. The yarn is manufactured through a distillation and bleaching similar to how paper products are made from other kinds of trees. The wood and leaves of the bamboo tree are harvested and ground into small parts. These parts are then steeped in a mixture of water and chemicals until they become soft, and then shredded apart until the individual fibers of the bamboo are released and form a pulp. This pulp is easy to manipulate and can be bonded again into many different shapes, but first it must be processed. The pulp is run through several filters that take away unwanted contaminants and unnecessary particles and then put through a bleaching process that turns the pulp white. Once the pulp is whitened, it can be dyed with a variety of different colors, bonded again into long fibers and wound into yarn. As a fabric, bamboo is claimed to be soft and flowing, with a tendency to take on different colors well and strong water permeability. This means towels made from bamboo yarn can easily absorb liquid. Clothes made from the same are both breathable and sweat-resistant. 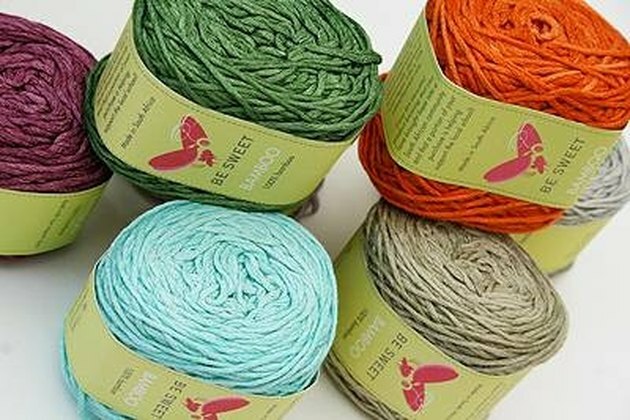 Bamboo yarn is also used to make mats, stockings, bed clothes and undergarments. Other types of bamboo yarn go to making surgical clothes, masks and other types of medical cloth. This is due, in part, to the qualities of the naturally present chemical in bamboo wood known as "bamboo kun," which resists pests and bacteria. Advocates of bamboo claim that these chemical properties continue into bamboo yarn and help fight bacteria in its diverse forms. Bamboo yarn can also be used to create decorating materials, such as curtains and wallpaper. These materials are thought to be mold-resistant and eco-friendly, although bamboo has also come under criticism because of the process used to create clothing and yarn. As in all pulp-creation process, toxic chemicals and large amounts of water must be used to turn the wood into usable clothing. Can I Use Maple Board for Outdoor Furniture?